Valvrave the Liberator completed its run last night, bringing an end to one of the most gloriously campy, amazingly insane, and stupidly awesome mecha shows ever created. As one of the first anime I took on after I began Anime Marathon 2013, it’s only right that this will be one of the final reviews to round out 2013. Well, how did it end? This is a review covering the series as a whole, not just season 2. Valvrave the Liberator follows the story of Haruto Tokishima onboard a neutral JIORan module in a Dyson Sphere. After JIOR is attacked and annexed by the extremely campy nation of Dorssia (have you seen their uniforms? Fabulous! ), Haruto comes across a giant mecha: the Valvrave I. For reasons I’ll leave open, Haruto gets into the cockpit of the Valvrave and proceeds to wipe out the Dorssian forces that are attacking the module. The victory is broadcast via social media across the entire world, making Haruto an instant giant mecha celebrity. As time goes on, Haruto and company uncover mysteries and global conspiracies, while simultaneously exploring the concept of being a Valvrave pilot and the implications of being one. Oh god, this series is so unintentionally hilarious. Some scenes in the series get played really, really seriously and they don’t come off like it at all. This would be a bad thing if the series wasn’t already ridiculously campy already. The show is so self-aware that the hilarity almost feels natural. I’ll talk about the camp in a minute. I still love Valvrave’s animation, although time has tempered my feelings. The animation style is still gorgeous and, in general, scenes are extremely well done. Even the fight scenes flow better than most action mecha series. The character animation can slack a bit at times (I noticed this more in the second season), but overall it still looks very fine. Both the opening themes were awesome. Nana Mizuki and T.M. Revolution brought their A-game to Valvrave’s openings and it shows. As if that weren’t enough, I also liked the second season’s ED 1 and ED 2 (warning, there are mild spoilers contained in the EDs). Valvrave is so gloriously campy at nearly every moment. Valvrave slathers on nationalism stereotypes, fabulous outfits, insanely preposterous dialogue, huge clichés, and completely insane plot twists/reveals, thus creating what should be the worst thing ever. Somehow Valvrave makes it into an absurdly delicious cocktail of insanity due to its self-awareness. Valvrave deals with a whole bunch of mature topics about war and change, but the majority of the dialogue comes off as completely, deliberately ridiculous and not nearly as serious as it looks on paper. The exaggerated ERUERUFUU (which became a mini-meme within the community as you can see), L-elf’s generally hilarious reactions to... uh... everything, “Blitzendegen!”, “Call me Moses”, LET’S PUSH THE MODULE SOMEWHERE ELSE!, and anything involving Q-vier (“This one’s still alive! !”) to name just a few. It isn’t an exaggeration to say that Valvrave has turned the camp here into an art form. In the exact same way, Valvrave’s story is all kinds of insane and absurd, but it comes through the screen as something incredibly awesome. The story is completely, gloriously insane at pretty much every moment past the first episode. Valvrave has almost become famous for its completely nuts wham episodes. Let’s be clear about something: Valvrave doesn’t care about your mental health. It will hand you giant, nutter episodes on a platter that will leave your mouth open in confusion or in horror. They’ve even made an art out of insane plot twists! How the hell did they do it?! In addition, the show can get some pretty good tear jerker moments going despite the hilarity. There are some serious feels flying around during a few episodes that some may shed a few tears over. The Valvrave pilots themselves have a surprising amount of depth to them (although nearly every single one contributes to the hilarity and camp somehow). Every one is pretty campy as-is, but they somehow manage to feel real in a weird sort of way. Despite the rampant clichés and character tropes, their character growth and development will somehow manage to get you to like them. You’ll seriously start to enjoy the company of them, at least I did. Valvrave is absolutely insane. If you hold out any hope that Valvrave will start to be normal, you’re hoping in vain. The plot is nuts and the dialogue unintentionally hilarious. The setting is campy and the characters are very cliché (but awesome). If you want anything normal, this is not what you are looking for. The ending isn’t quite as epic as the build up may have led many of us to believe. The series and its insanity were building up to an insanely epic (and nuts) conclusion and we didn’t quite get it. Considering how the series was totally fricking nuts though, we should have figured the last thirty seconds would be unintentionally hilarious again. I should be ashamed for thinking anything less. Valvrave’s ending is far more akin to the introspective Guilty Crown’s ending rather than Code Geass’ emotional ending. If the ending had been a little bit stronger, this probably would have been one of the best giant mecha shows I’ve seen in years. It’s absolutely nuts, campy, and unintentionally hilarious. It’s turned its craziness into an art form that is unlikely to be surpassed by many anime in the past or the future. The plot of Valvrave has absolutely zero care for your mental health. It will constantly toss WHAM lines and episodes at you. The insane plot twists and completely nonsensical plot developments will only contribute to the sharp decline in everyone’s mental health. What? Did you think this was a therapy session? This is VALVRAVE! When it comes right on down to it, Valvrave isn’t treading any new territory. The themes its exploiting aren’t all that new or revolutionary but I didn’t care. The show’s strength lies in its amazing execution. It’s amazingly campy execution. This is best for someone that wants a shamelessly awesome mecha show that doesn’t care for particularly deep thought. It has an insane plot and it will be remembered for it for years because of that one fact. If you’re willing to endure a certain degree of disbelief for the sake of unintentionally hilarious dialogue and awesome action, then Valvrave is your destination. Look no further. I will remember Valvrave fondly for the rest of my days. You were a nutter companion on this marathon Valvrave... I’m sad to see you go. 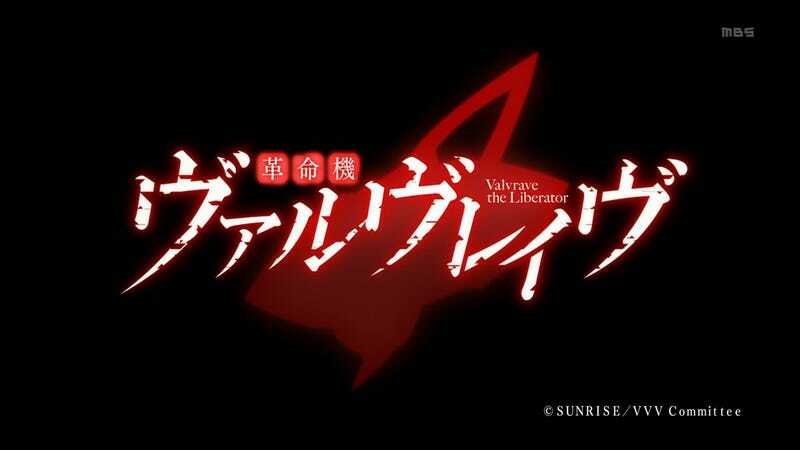 Valvrave the Liberator is available for streaming on Crunchyroll and Hulu. Code Geass is complete, so a review should be incoming. Something else Gundam related will be happening too. White Album 2 ends later this week too. My last review item is in progress and is due to be ready on the 31st. This is part of my Anime Review Marathon that I began in October 2013 to record my thoughts as I watch a variety of anime on my ever growing backlog. These reviews won’t come out on a consistent basis, they’ll come out when I feel I have seen enough of a series to pass a judgement on it, although I will usually finish the whole series before the review. You can see all my articles on Dex’s Corner.